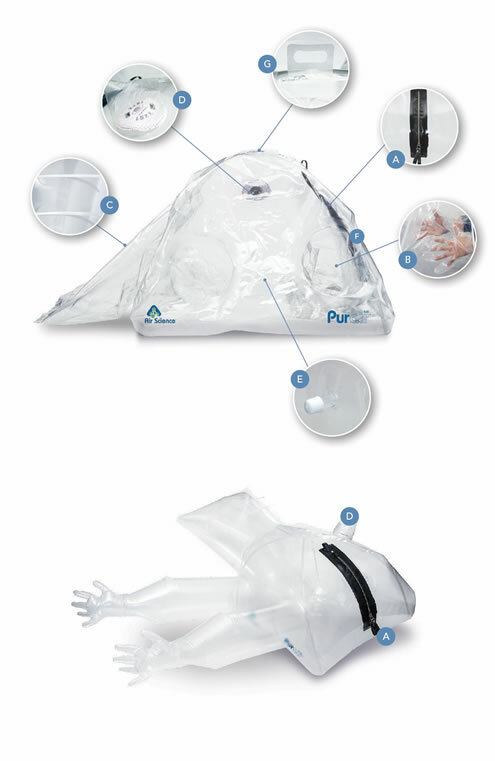 The Purair ® FLEX is a revolutionary containment product that redefines when and where glove bags can be used. Designed as a flexible, highly portable film isolator, the Purair FLEX permits easy set up and delivers superior containment capability. The Purair FLEX is constructed of ArmorFlex ® film which offers complete visual clarity and excellent solvent resistance across a range of chemicals as confirmed by independent product testing. Compliant with Multiple Criteria. 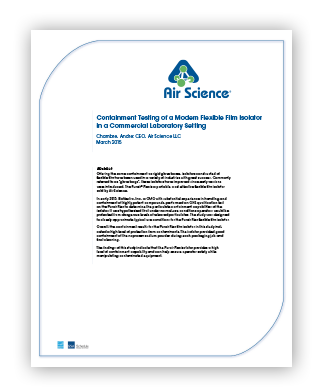 ArmorFlex film complies with FDA 21CFR and 2002/72/EC standards for minimal outgassing, solvent and biological reactivity and static resistance. Pharmaceutical Grade Materials. The Purair FLEX is constructed with FDA approved pharmaceutical grade LLDPE1 anti-static and ESD2 safe and meets European ATEX Directive. Large Workspace. At 30" (762 mm) wide and an internal volume of 3 cu.ft. (85 L) the Purair FLEX provides a large work area with a 12.5" (317 mm) gas tight zippered access with a 6" (152 mm) diameter opening. Oxygen-free Work Zone. A nitrogen gas barb is a standard feature to permit creation of an oxygen-free workspace. Spacious Interior Volume. An innovative curved film design provides maximum working volume and visibility. Easy Setup. Semi-rigid support rods simplify set up and increased stability even if the bag is not inflated to full pressure. Bag-In/Bag-Out Safety. Additional HEPA filter, Bag-in/Bag-out Port, and Nitrogen purge inlet connections enhance safety to meet specific needs. 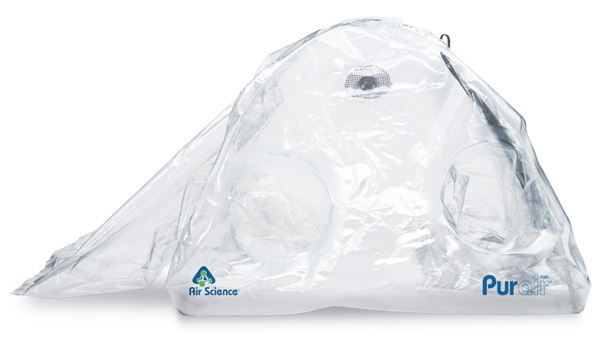 A 7" (200 mm) diameter bag-in/bag-out minimizes exposure to contaminants when changing the filter. The contaminated filter is safely removed through the port and placed into a bag, sealed with a reuseable cable tie, and disposed. A new bag is affixed to the port when the replacement filter is installed. The Purair FLEX shown under positive pressure. Gas-tight zipper access (A) and HEPA filtration port (D) protect personnel and the environment. A. Angled Zipper Entry: Gas tight 12.5" (317 mm) zipper with an effective 6" (152 mm) diameter opening. B. Sealed Ambidextrous Gloves: Allow maximum protection and one size fits all design. C. Bag-Out: Includes 14" x 24" (355 x 609 mm) bag-out port with reusable cable tie. D. HEPA Filtration: 3M 2097 P100 particulate filter certified 99.97% efficient at removing solid and liquid particles, including those containing oil. Composed of 3M’s Advanced Electret® media, the filter provides a lightweight, easy breathing combination better than fiberglass. The filter meets NIOSH P-series test criteria and is flame and water resistant. E. Nitrogen Barb: Standard feature to allow users to create oxygen-free workspaces. F. Internal Support Rods: Internal FDA-compliant polypropylene support rods provide structure stabilization even when bag is not fully inflated. G. Carrying Handle: Folds flat when not in use. Puncture Resistant Construction: Pliable, solvent resistant ArmorFlex film is (8 mm) thick to prevent accidental punctures.